Happy December! Many of us get very excited about decking the halls for the holidays. Including our children in the process can make the season even more magical. I've found that decorating with bits from outside feels very satisfying to ALL of us. We have an abundance of pine cones. Look at what is 5 feet from my back door! We are anxiously awaiting our first real snow. So this year, I handed out paint brushes and white paint along with bunches of pine cones. It's slightly messy, but very fun work, to create your own snow covered cones! Try sprinkling on a little coarse salt or sugar, (glitter would have gone over well, too!) while the paint is still wet. This little swag is very simple for a child to participate in. Our snowflake puncher works like a charm with a vintage road atlas. - The Crafty Crow has just begun their annual December Book &Activity Advent. We did it last year and it's fantastic! -There is a lovely (grown up) snowy pine cone craft on Crafty Crow today, too! -Our favorite red and white twine (thicker than standard baker's) is still available right here. Wishing you all a simple and beautiful start to your holiday season! neat, that's neat, Maya !! I also used coarse salt last year for imitating snow ! I love your decorative touches! My youngest and I went out and collected pine cones for our Thanksgiving centerpiece (just pillar candles and pine cones on a rustic wood platter). He's got such a particular eye, it was a hoot seeing him select and arrange things just so. He's such a designer! Great idea, especially the salt/sugar. i have a feeling we will be making these in the next few days. Love this! Pinecones are so festive aren't they?? I am really missing the ready availability of pinecones since I moved to Florida! I am having a hard time figuring out how to decorate a house naturally on a budget here. I need to find some type of substitute. love the snowflake punch! where did you get it? I love these ideas and will be making some soon! So excited for the Crafty Crow's book activities too. They are such a great resource and inspiration. Another great idea! You are inspiring me so much this year - I am hoping to adopt your advent, though it might be the 12 days of Christmas:) And this one, so cute! My pine tree had to be cut down last year and I miss all my cones! Although I noticed a few on the ground today. I think they were stuck in the top of the birch trees and got blown out by the windstorm - how funny! I still have plenty of blue spruce though and they are constantly dropping cones! Beautifully done. 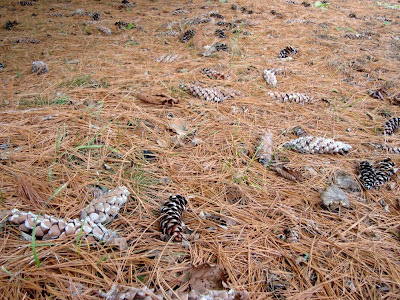 We are going out to collect pine cones tomorrow, even though it is Summer here! so lovely! 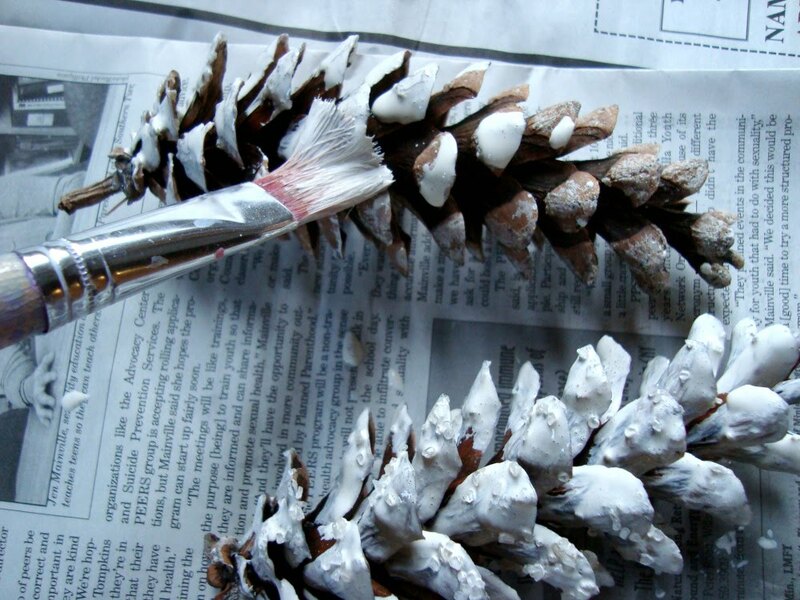 I actually just did something similar (great minds...hehehe) for my Christmas bazaar I had last week - except I sprayed the pinecones white...painting is much more kid friendly so I will have to try this with my little boy! Thank you Maya for using the cotton twine! I loved to see your ideas! Best wishes for the holidays and I hope to seeing you again in 2010. What a wonderful idea! We are in the deep, deep south and snow is very rare! My kidlets will LOVE this! 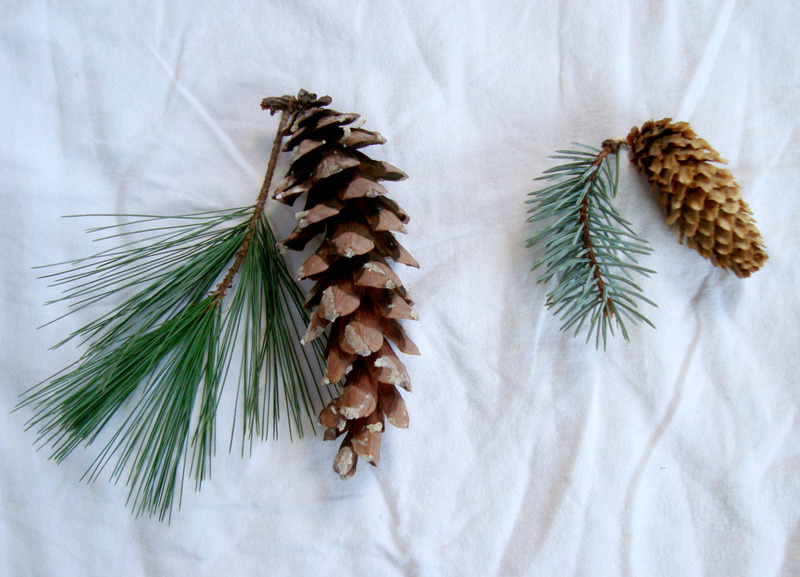 I've been pulling out the pine cones I saved from last year and yet I need a few more from the forest. When we go cut our tree, we'll gather some more. 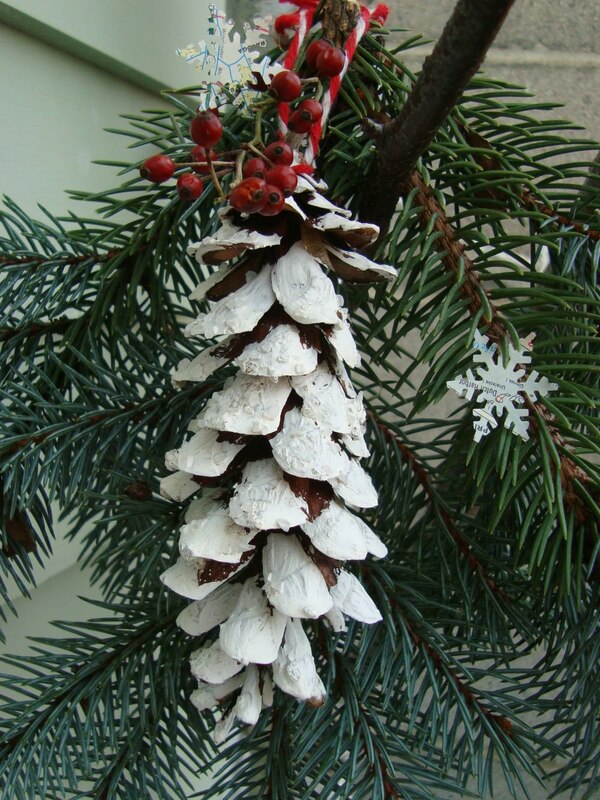 I think the white painted/sprinkled cones look so simple and elegant. I just bought my snowflake punch yesterday and I'm excited to get started. Thanks, Maya, for the inspiration! When my kiddos were little, I bought a new Christmas book each year to add to our collection of Advent reading. Such fun memories! My girl would love this--especially with the glitter. Jessie's Girls--lots of stuff is evergreen in Florida, so use that for decorating. Magnolia leaves, nandina berries, smilax, ivy--all make beautiful arrangements for Christmas.